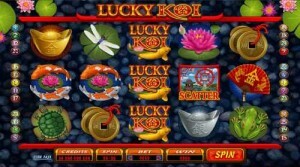 Red Flush Casino :: Lucky Koi online slot game :: PLAY NOW! Red Flush Casino is offering plenty of action in a tranquil setting with its latest video slot – the 5 reel, 25 pay-line LUCKY KOI which launched this week. The scene is an exquisite pebbled water garden populated by these brightly coloured Asian ornamental fish refined over thousands of years, along with dragonflies, water lilies, frogs and a slew of other aesthetically appealing features. Finning lazily along is a selection of koi that ranges from the traditional bright red and white Kohaku to the more contemporary metallic-coloured Ghost Koi. The unusual theme for this game is carried by truly stunning graphics that capture the brilliant colours, shapes and shadows of a cool water garden at its best. But when you’ve admired the aesthetics, its down to the business of betting… and this game gives you a number of routes for reward! First there is the Lucky Koi logo which acts the Wild, enabling you to build winning combinations by substituting for other symbols. Then there’s the stone lantern Scatter; 3, 4 or 5 of these triggers the generous Bonus Choice, offering you either a random bonus of between 10 and 30 Free Spins with up to 5x Multiplier or an interactive fishing trip at the koi pond. Armed with a bamboo fishing pole, you have between 3 and 6 chances to pick a ‘nishikigoi’ – a ‘brocaded carp’ – and earn a prize, or perhaps an extra pick. The word ‘koi’ in Japanese sounds phonetically like a word for ‘love’, and that’s what you’re going feel for this entertaining and rewarding game with a unique theme – click over to Red Flush Casino now and see what you can catch!